On Friday and Saturday I had a wonderful time at the annual NECTFL conference here in New York. NECTFL stands for the NorthEast Conference on the Teaching of Foreign Languages. It started as an independent conference, but is now the largest of the regional conferences under the umbrella of ACTFL, the American Council on the Teaching of Foreign Languages. I’ve attended NECTFL several times, and this year, for the first time, presented a talk. The talk was based, not surprisingly, on my book, but with an appropriately pedagogical twist, to focus on how foreign language teachers can bring linguistics into the classroom. 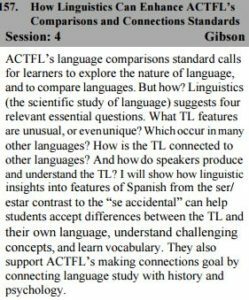 The conference theme was standards for foreign language teaching, so I shaped my talk around two of ACTFL’s official standards: Comparisons (with other languages) and Connections (to other disciplines). In the talk I managed to work in two other standards: Cultural comparisons and — the big one! — Communication. The abstract is below. My talk had a decent turnout, especially since there were more than a dozen concurrent talks for attendees to choose from, and was well received. I had some promising follow-up conversations, including an offer of collaboration and an invitation to speak at another conference. I’m also planning to write up my talk and submit it to one of the ACTFL journals. Bloomsbury Linguistics had rented a table in the conference’s book exhibit, and sold every copy of my book that they had with them, in addition to taking advance orders. This made me very happy. I figured that if I couldn’t sell my book at a conference for language teachers, I was in big trouble. As in previous years I learned a lot from the talks I attended. My chore today is to go over my notes and the handouts I accumulated, and digest the specific techniques that I can implement (i) immediately and (ii) later in my own teaching. In many talks I was struck afresh by the dramatic differences between K-12 and college teaching. Most attendees, and all the presenters I heard, are K-12 teachers. They have lots of time to work with their students, and usually have a classroom to call their own. As a college Spanish teacher I have less time to cover more material, and share an anonymous classroom. On the other hand, my students are more mature who are strongly motivated to do the work and earn good grades. These environmental differences will play a large role in how I adapt the techniques I learned in the conference. I had a final dose of Spanish after the conference, when I struck up a conversation with an Argentinian family at an excellent taquería where I stopped for a bite on my way to the train station. (It isn’t hard to recognize Argentinian Spanish, but of course I was pleased, and these tourists somewhat surprised, when I guessed their nationality.) We chatted a bit about my two idiosyncratic Argentinian obsessions: pato, the gaucho version of polo originally played with a live duck, and the linguistic isolation of Argentinian Spanish during the formative colonial period, which was the subject of my first blog post back in 2013. Now I have friends to see when I eventually visit Buenos Aires! This entry was posted in Spanish in the world, ¿Por qué? 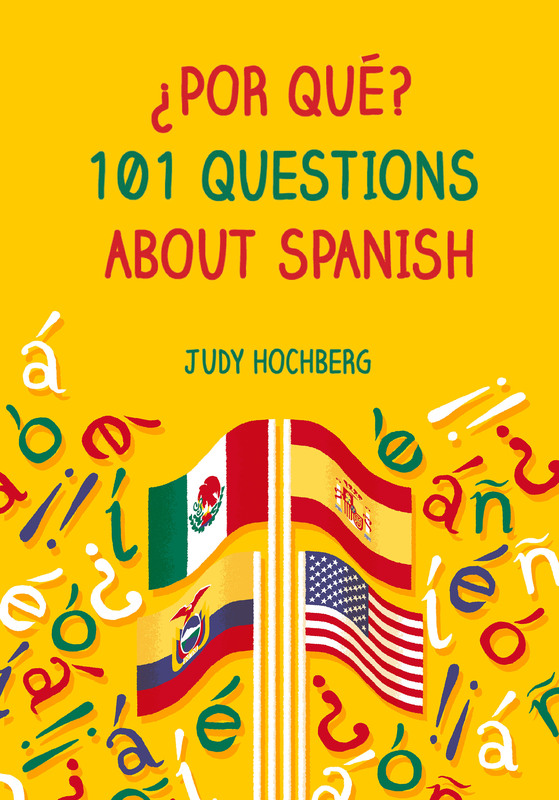 101 Questions about Spanish and tagged ACTFL, Argentina, Argentinian Spanish, Bloomsbury Linguistics, NECTFL, pato on 12 February, 2017 by jhochberg.